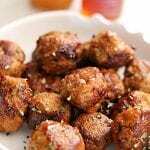 These Honey Chipotle Meatballs are a delicious appetizer full of sweet, smoky, and spicy flavors. Pair these homemade turkey and sausage meatballs with rice for a quick and easy dinner. This is a sponsored conversation written by me on behalf of Beesponsible® and Bee Harmony® Honey. The opinions and text are all mine. Meatballs are one of those foods that I sometimes feel guilty buying frozen because I know I could easily make them from scratch with more flavor. Making homemade meatballs not only requires a lot less ingredients but it also allows me to customize what meats I use. We typically use turkey (to accommodate my oldest’s beef allergy) but I decided to also add hot Italian sausage to these Honey Chipotle Meatballs for added flavor and spice! 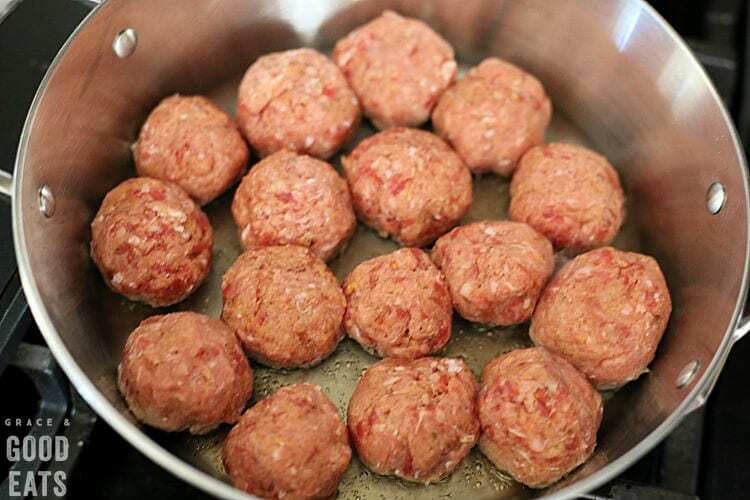 Keep in mind that the fattier the meat you use, the more tender your meatballs. Watch the cooking a little more carefully with leaner meats (like turkey) because the lack of fat can cause them to overcook and become tough much more quickly. The already spicy sausage cuts down on the need to add much more to this simple recipe. That said, it is crucial to always salt the meat. Generally speaking you will need about 1 teaspoon of salt per pound of meat. Cut back slightly if you are adding a salty cheese, like Parmesan, to the recipe. Meatballs are best when worked together by hand because you are less likely to over-mix. A spoon won’t be enough and a stand-mixer would be too much- you don’t want to crush the meat or work the mixture into a paste, full pieces of ground meat should be visible. I like to wear plastic food service gloves or even steal my husband’s medical gloves (just make sure to wash them first) to keep my hands clean during this step. If getting all up in that raw meat doesn’t bother you, then go for it! It’s also important to consider the size. You can make large 2 inch meatballs if they will be served on their own or miniature ones if adding to soup. I opted for a medium size, like I would do if serving with spaghetti, for this Honey Chipotle Meatballs recipe. The actual size is personal preference but it is important that they be uniform so they all cook evenly together. 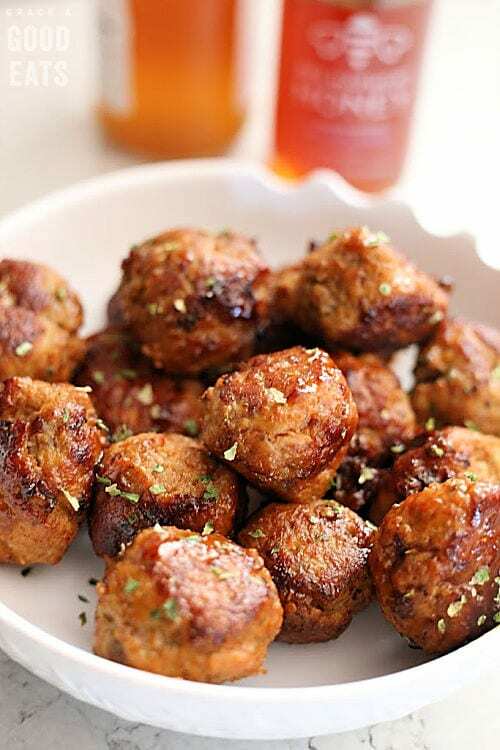 The honey chipotle glaze is what sets these meatballs apart and makes them perfect to serve as a holiday appetizer or to pair with rice for an easy weeknight meal. How cute would these be on a holiday platter with the cherry red glaze and bright green flecks of parsley? I might even halve the size to make miniature meatballs (thus doubling the yield) and serve them with festive toothpicks. 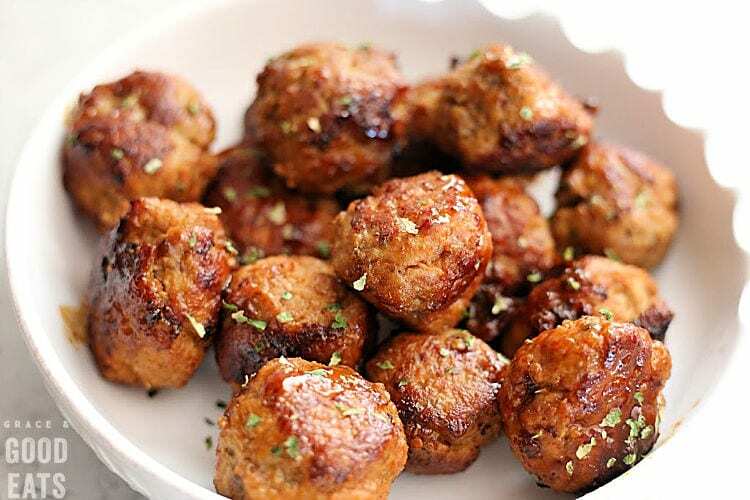 I used Bee Harmony Honey to make the delicious smoky, sweet, spicy glaze for these homemade meatballs. Bee Harmony Honey is premium raw honey handcrafted for the love of bees. It’s made the way nature intended, with bees drawing nectar from wildflower blossoms across superior forage lands, tended by trusted beekeepers, using responsible practices that respect the environment. If you’d like to try Bee Harmony Honey for yourself, be sure to use my discount code: GRACEGOODEATS15 when ordering online for 15% off! Beesponsible also just released a special Bee Harmony Honey Mini Gift Set, perfect for sampling four deliciously different honey varietals! 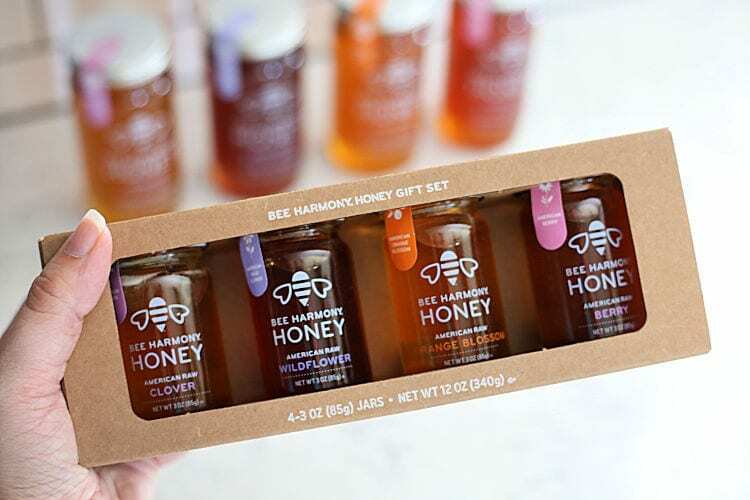 This specially packaged raw honey gift set features a sweet spread of American Bee Harmony varietals: Clover, Wildflower, Orange Blossom and Berry. Bees pollinate our fields, orchards and gardens— in fact, one-third of our food and 90 U.S. crops rely on pollination!— but because bees are being threatened by pests, pathogens, pesticides, poor nutrition, and habitat loss, they need our help. Giving the gift of Bee Harmony Honey is an opportunity to give back to the bees. In a medium bowl, mix together turkey, sausage, garlic, salt, ground pepper, bread crumbs, and egg until combined (do not over-mix). 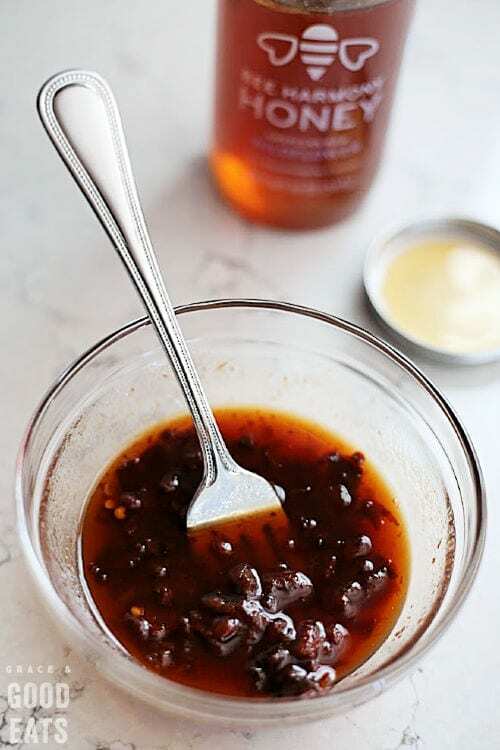 In a small bowl, stir together honey, chiles, and vinegar. In a large ovenproof skillet, heat olive oil over medium-high. Add meatballs and cook until browned on all sides, 10 to 12 minutes. Transfer skillet to oven and bake 5-7 minutes. 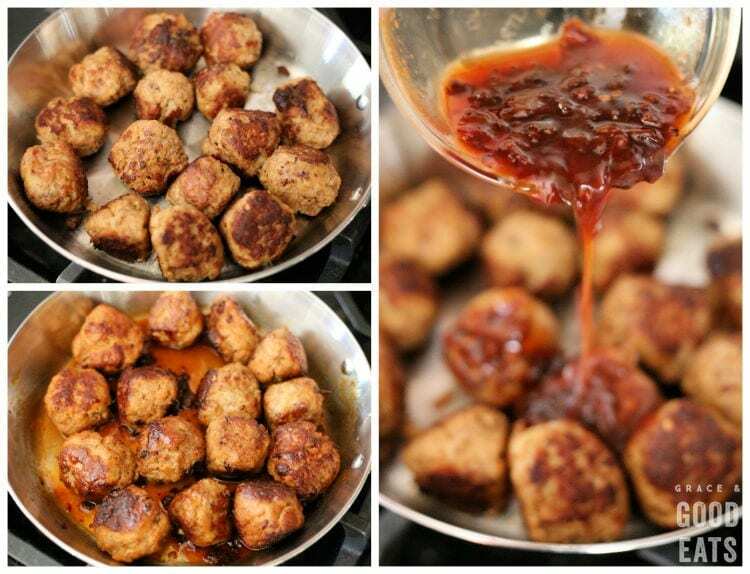 Remove from oven, turn the meatballs and pour the honey mixture over them. Return skillet to oven and bake until liquid is reduced and meatballs are glazed, about 5-7 minutes, swirling glaze again halfway through. 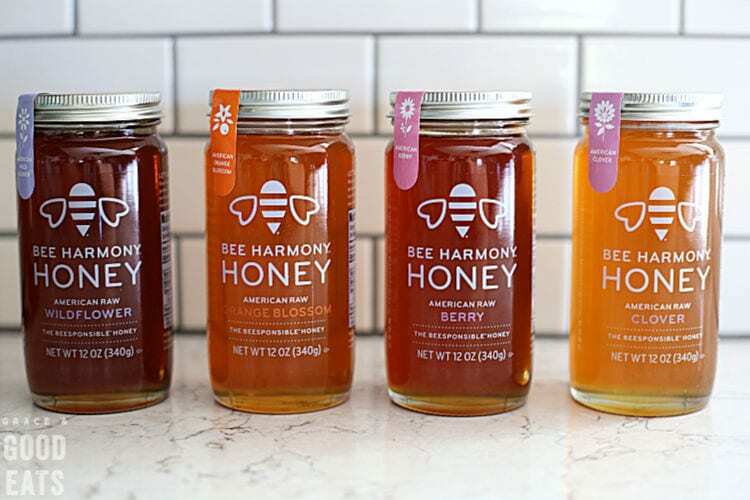 Bee Harmony Honey is available in several regional and local varieties. Details on the various regions and types of honey can be found on the Beesponsible website. That glaze sounds INCREDIBLE!!! I always love your step by step photos, they are so helpful! Thank you! These look so good, they will be perfect for my holiday cocktail party. I also love that little honey gift set. That would make an amazing hostess gift!